Personal injury law firm focusing on car accidents, medical malpractice, DUI/DWI, and wrongful death in Charlotte, NC. I am BEYOND grateful that Corey Rosensteel and his paralegal Pat Hicks represented me on my case. Not only did everything go smoothly.. but they both went above and beyond for me treating me like family, being there for me every step of the way. I have only amazing things to say about this law firm and I would recommend them to anyone in need of a lawyer / law firm. If I could, I’d give Corey and Pat 10 million stars! They took great care of me after my accident and are awesome at communicating with you along the way, would definitely recommend them! An amazing firm with the best staff!!! After having a traumatizing injury and all the stress that comes with that, I was able to find this attorney's office. Matthew Fleishman and his case manager Luis Panesso not only took the stress away but produced an awesome outcome in an impossible situation. They communicated every step of the way and answered every question I had. Needless to say, I'm extremely satisfied and would recommend to friends and family without a doubt. My grandma and I came to them with a problem and they took very good care of us and we really appreciate them for that. It was a pleasure and I would recommend anyone to them. Very friendly and loving people who gets the job done. We appreciate the awesome way we were treated.The questions were answered in a very good manner and Matt and Isaac are number one in our books.They were very prompt in returning calls in a timely manner. If you need a good firm that will treat you like family this is the one. I wish I could give them 10 stars. This is my 2nd time using Rosensteel and Fleishman, they really do work for you. Keeping you informed and looking out for your best interest. Their staff is friendly and very professional. I highly recommend this law firm team if you need the services they provide. Thank you all again. Hands down the best attorney ever!!! I was in an accident last year and ended up having a lot more pain than I could have anticipated. After several months of being with another attorney I felt strongly things were not being done properly. They ended up treating me horribly at the end and so I sought out another attorney. After coming to Fleishman the experience was a world of difference. They know what they are talking about!!! They communicated regularly and always made sure to walk me through what was happening. They thoroughly explained all my options. The stress this attorney took off of me was life saving. I felt I could finally focus on just getting better. I will never be able to thank this firm enough and make sure all my friends and family know who to use should an accident ever happen to them. I would give them 10 Stars if I could!!! I highly Recommend my family and friends They did an Awesome Job I am Greatly Satisfied and Happy with my Results They make sure you are well taking care of. They Aim for Victory.. I had the unfortunate experience of a hit and run car accident in the spring of 2018. This accident required physical therapy and counseling. The damage was a total loss. Rosensteel Fleishman were highly recommended to help assist with my case. This was my first time seeking legal counsel, so as you can imagine, I was a bit reluctant. However, that changed while working with Isaac and Matthew. Not only did they explain all the what’s and why’s, they were patient and answered any questions I had throughout the course of the settlement. They were timely with their responses and communicated all options on the table. This experience totally soothed my anxiety about seeking legal assistance. I would highly recommend this firm. They will take time to understand your situation and guide you from there. Thank you so much for a smooth experience. From the very beginning this firm worked diligently to not only make a difficult situation easier, but to also make sure that we were appropriately compensated. Matt Fleishman and Isaac Barker are the best in the business. HIGHLY RECOMMEND... Worked with Attorney Matthew Fleishman and Isaac Barker - both are professional, helpful and knowledgeable. Definitely feel they look out for the best interest of their client(s). Highly recommend. Very professional and am very happy with everything they did for me! I had an an amazing experience with the Fleishman group. Tiffany and Luis were excellent and very helpful with my experience. They upheld the highest professionalism at all times and made it a top priority that my case be handled expeditiously. My attorney Corey Rosensteel is an seasoned professional and will take care of your every need. I will use the same team in the future and I recommend them to anyone in need of attorney services. Thanks guys!!! HIGHLY RECOMMEND! My husband was in a car totaling crash where he sustained neck & back injuries as well as a concussion that caused months of issues. The person who hit him did not have insurance. I can’t explain the hell we went through before we found Matt Fleishman and Issac Barker. It was a tricky situation and without their legal help and expertise we would have had even more headache(then he was already experiencing). They knew exactly what steps to take and handled all his dr bills as well as recommended great drs. Issac personally called just to check on us, some of those calls I spent crying to him as a wife seeing her husband suffer. Thankfully my husband recovered and we were able to get our case settled to our liking. If you want results, expert legal advice & kind people handling your troubles I would go here!!! Thank you so much for all the time you put into handling every piece of this horrible experience so we didn’t have to! I can firmly say they went above and beyond! I cannot recommend this law firm highly enough. I am very much satisfied with the way the case settled. Paralegal, Luis, had always kept me updated on my case and at every stage of my case, Mathew thoroughly explained the options and let me take the informed decision; and answered all my questions througout the case as well. Very happy with the settlement, Thanks to Matthew and team. Highly recommended law firm. Excellent communication and customer service. Cory was very easy to talk to each step of the way. Isaac was amazing to work with. He answered every question I had along the way as well. I would highly recommend this firm. Corey Fleishman and his staff are fantastic. Calls, emails and any questions you have are returned promptly. Every aspect of my case was explained thoroughly to me. I highly recommend this law firm to anyone who has been in an accident. Luis was always patient and informative. Great job on mine and my children's settlement. I HOPE to never have to go thru this process again, but if I do....Rosensteel and Fleishman will get the first call.. Great job everyone! I highly recommend this Firm. Cory and Issac were always extremely professional and frequently went above and beyond the call of duty. They worked diligently, always responded quickly and answered my unending questions with grace and patience. I wouldn't hesitate to reach out to them again if I needed legal advice/counsel. 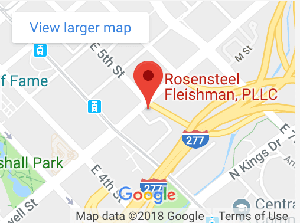 Rosensteel Fleishman was recommended to us to help with an auto accident. Our attorney Matt Fleishman and his paralegal were very professional and patient when aiding my elderly parents with their situation. Throughout the process, they were always available and kept us abreast of what was happening with the case. I would and have recommended them to friends and family. I can not say enough about this law firm. They were very professional but had a way of making you feel like you were their only case. They worked so hard for us, kept us informed at all times and we are very pleased with the outcome. Cory was so helpful and straight to the point. Isaac is so professional, polite and works harder than anyone I know. He was always on top of everything and his knowledge on everything about our case was incredible! I highly recommend them and their services! I am grateful to have worked with Cory Rosensteel and his team, I personally worked with Isaac Barker. A great team that really helped me understand and answer any questions I had along he way. Very happy with the way the case settled thanks to them. Will definitely be recommending them to anyone looking for great team. Copyright © 2005 - 2019 by Rosensteel Fleishman, PLLC. All rights reserved. Powered By: Revenue Surge, Inc.